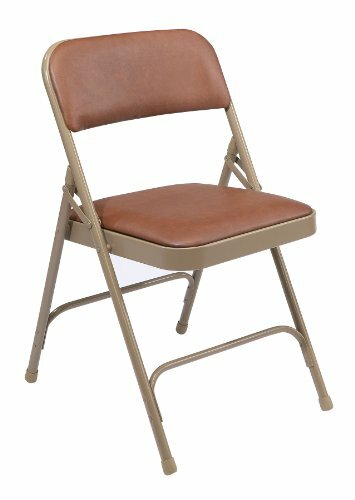 The National Public Seating 1200 Series steel frame upholstered premium vinyl seat and back folding chair has a beige 18 gauge, 7/8" tubular steel "Y-frame" structure, honey brown upholstered vinyl seat and backrest, double-riveted front and rear leg cross braces, double hinges on each side, and it folds for efficient storage when not in use. This chair meets the American National Standards Institute/Business & Institutional Furniture Manufacturers Association (ANSI/BIFMA) standard for drop weight support of 300 lb., and it supports 480 lb. of static weight. It has double-riveted front and rear leg cross braces and double hinges on each side for stability. The seat and backrest are upholstered for comfort, with 1-1/4" thick, 0.9 lb. density foam in the seat and 1.2 lb. density foam in the backrest, and covered with 0.8 mm thick vinyl that is water resistant for easy cleaning. The seat has a rounded, "waterfall" front edge to help reduce pressure on the back of the knees. The steel frame is powder coated for corrosion resistance. Replaceable polypropylene glides help protect floor surfaces. Plastic plugs at the top of the back legs have a slot shaped to hold the frame and add stability. These plugs and the floor glides match the frame color. When folded, the chair fits very close to another of its kind for efficient storage, making it suitable for institutional temporary seating applications.